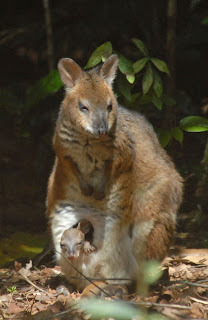 This pademelon mum and joey stopped in the garden for a few moments to enjoy the (rare) sun. They didn't stick around. Things to do, I expect. Definitely the weekly cute! Instead of "cute" i have had a skunk coming by the past 3 mornings. I haven't seen it, but she/he is definitely making it's presence known. Monday, the remnants were still lingering in the house when I got home after 17.00. They probably headed out to buy Junior his first pair of shades. Oh, yes. The paddies do a good line in cuteness!